Sometimes, persistence in seeking a particular outcome from the family court pays off. After two appeals and years of litigation, one former husband is closer to obtaining a modification of his alimony payment, after a change in jobs left him with an alimony payment larger than his monthly salary. The couple at the center of the case titled Huang v. Huang had two children and divorced in 2005. Their property settlement agreement included a provision that the husband would pay the wife $1,800 in alimony each month, alongside $1,700 in child support. The husband was solely responsible for the children’s college expenses under the agreement. At the time of the divorce, the husband worked a high-paying job for a pharmaceutical company, earning approximately $132,000 per year. In 2006, he remarried a manager for a pharmaceutical company. In 2010, the husband was laid off, at which point he stopped paying alimony. The couple reached two consent orders when the wife went back to court to compel alimony payments. After failing to find a job in the US, the husband took a job with a pharmaceutical startup in China, paying him $18,000 a year without any benefits, or about $1500 a month. His current spouse remained in the US and earned $110,000 a year. The husband sought a modification of alimony in September of 2011, citing changed circumstances, but his motion was denied on the basis that the husband had accepted that lower-paying job, with the court assuming that it would only be a temporary position. Additionally, the husband had not stated affirmatively that he did not receive other forms of compensation from his new job, and had no tax filings or other supporting evidence of his income. The husband again sought a modification of alimony in November of 2013, arguing that his changed circumstances were permanent. The court held a hearing to investigate what sort of compensation other than salary the husband may have been receiving, including the presentation of several years of W-2s and tax returns, testimony from his company’s CEO regarding the bare-bones nature of compensation at the young company, and testimony on his ongoing search for a higher-paying position. According to testimony during the hearing, the husband and his current spouse took out a $200,000+ mortgage on their home, which he claimed his spouse paid off in 2012 on her own. However, on further investigation, he admitted that a portion of his severance went toward the mortgage. He asserted that he used the last of his remaining stock options from his former job to pay the tuition of the children from his first marriage. The court also received evidence about the husband’s 401k account during this hearing. Despite the fact that the husband claimed not to have made any contributions, the value of his 401k account from his former employer increased in value from $544,389 in 2011 to $821,448 in 2013. The husband attributed this to “market performance.” The court did not find this testimony credible, and also found it suspicious that the husband’s 401k statements included entries labeled as “employer match” contributions. 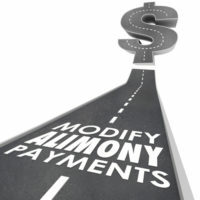 When the wife requested that the court dismiss the husband’s application to modify his alimony payments, the court did so, noting that based on, among other things, the 401k statements, it did not appear that the husband’s circumstances had truly changed so that a reduction in alimony was warranted. The husband requested that the court provide him with another opportunity to present evidence in support of a modification through a motion for reconsideration, but his motion was denied. The husband appealed, and the Appellate Division sided with the husband, granting the motion for reconsideration. The Appellate Division ruled that, since a number of years had passed since the husband’s initial request for modification of his alimony payment during which time the husband’s circumstances remained the same, and since the husband could support his claim with substantial evidence, he had made a preliminary showing in favor of a modification of his alimony payment. Further, the Appellate Division reexamined the statements from the husband’s 401k and found that the judge for the trial court had misread the statements, seeing an employer contribution where there had been none. Since the trial court judge had relied so heavily on those statements when making its decision, the Appellate Division found it necessary for the trial court to review its ruling in light of the correct meaning of the 401k statements. If you need experienced, knowledgeable representation in your New Jersey divorce or custody dispute, contact seasoned Union family law attorney John B. D’Alessandro for a consultation, at 908-964-0102.